THE ELECTION OF JEREMY CORBYN TO THE LEADERSHIP OF THE LABOUR PARTY WAS AS SPECTACULAR AS IT WAS SURPRISING. Winning handsomely among members newly registered supporters and affiliated trade unionists there can be no disputing his mandate to lead the party in a new direction, against austerity and the renewal of trident and in favour of greater equality and peace and disarmament. Except of course his mandate is being disputed. By large numbers of Labour MPs, former Labour Leaders and Cabinet members, fearing that their New Labour project has been seriously challenged and probably fatally undermined. By the mainstream media, disturbed that he appears (wisely) reluctant to play the political game by the established rules, even turning down a chance to appear on the Marr show in favour of a longstanding constituency commitment. By the rich and powerful, worried that he is promoting a real alternative. SUPPORT - for his challenge to what he himself has described as a 'ridiculous consensus' of recent years which has accepted that there is no alternative to austerity and cuts and has allowed the rich to double their wealth at the expense of the rest of us.. SUGGESTIONS - to improve and extend his promotion of s radical alternative, including making the addressing of climate change a central concern, along with the reform of our broken and discredited electoral system. If some Greens choose to leave the party to join a resurgent Labour Party then so be it. This will be a small price to pay. Many more will choose to remain, recognising that it is the Green Party that is offering the best alternative programme based on social justice, sustainable economics and democracy, and that it has a vital role to play in the building of the broader movement for radical change that is so desperately needed, and which will be crucial to Jeremy's very survival and to any longer term success. Saying no to xenophobia means saying yes to Europe. A knee-jerk case against the EU is easy to make. The case for staying in is less easy, but, I think, we need to argue it none the less. In terms of legislation or social gains it is worth mentioning in passing the working time directive, right to strike, some human rights legislation, freedom of movement etc. but really this is no longer enough to be decisive. Instead, we need to look at the likely implications for domestic politics of a referendum campaign and its outcome. Even if we all agree that the EU as an institution is structurally reactionary and anti-working class that does not mean that we have to vote for exit whatever the consequences. We have to look at what best serves the interests of the movement at the present time. One thing is clear, in or out, the offer to us is austerity and neo-liberalism and so we have to consider the best terrain on which to fight, before, during and after any referendum. Whilst the worst austerity visited on Greece and the rest of southern Europe has been driven by the EU and the ‘needs’ of the Eurozone that is certainly not the case in Britain standing, as we do, outside the Euro. The Tory assault on welfare, on wages and conditions is ideological and it is home-grown. A Brexit, particularly one led by the right of the Tory Party and UKIP and under a Conservative government, would simply sweep away the few safeguards we have remaining to us under European law the better to increase their attacks on us at home. I think that much is well understood by the left and the trade union movement in Britain. Placards and leaflets negatively referencing Europe, on the major anti-cuts demonstrations, have been few and far between and Farage’s demagogy about repatriating payments made to the EU to fund the NHS (for example) have had very little resonance. Instead, the referendum can only produce a reactionary exit that would be a clear win for the xenophobes and petty racists of the right wing of the Tory party and of UKIP who have wrung this as a concession from Cameron. It would be an exit entirely on their terms and it would immediately place EU citizens living in the country, particularly those from Eastern Europe, already demonized in the popular press, in a very difficult and vulnerable situation. If not facing immediate deportation, they would come under great pressure to ‘go back home’ – that’s our Slovakian neighbours, that’s my son’s Lithuanian friend. Without a doubt the central issue in the referendum campaign will be that of migrants and free movement of people. Indeed, UKIP have been very explicit about this stating recently that they will be campaigning first and foremost on immigration and not joining the official ‘no’ campaign in order to have a freer hand to do so. Any attempt to mount a progressive exit campaign will be drowned out. Some on the left – those influenced by the Communist Party, in some trade union leaderships and parts of the Labour Left have long held the view that jobs, wages and conditions for British workers are undermined by the freedom of workers from Europe to settle and work here..
Any attempt to mount a supposedly progressive exit campaign on such a basis would at best be drowned out and ignored and at worst be simply interpreted as a “British jobs for British workers” position. The right of free movement of people across Europe is one of the few remaining progressive aspects of the EU and it is one we should not only defend but champion. In that respect, the recent magnificent demonstrations in solidarity with migrants can give us some hope that a principled campaign against racism and xenophobia can gain traction within the wider referendum campaign but, for that to happen, we need to argue, however critically, to stay in the EU and fight for change. It is entirely understandable that the savage mauling of Greece by the institutions of the EU and the Eurozone should have led people to question whether we need to break with the EU altogether. However, we should remember that the Greek people have been fighting to stay in the EU whilst rejecting the terrible sacrifices they were being asked to make in order to do so. There are no separate national routes to ending austerity and neoliberalism- the enemy is transnational and should be fought as such. In solidarity with the people of Greece, Spain and elsewhere, we should stay in and fight alongside them. GREEN PARTY CONFERENCE MUST NOT BE A STAGE MANAGED EVENT LIKE THE FAILURE WHICH IS NEW LABOUR CONFERENCE.! Ex Labour Party members who have joined our great party will tell you how clinical and controlled the Labour Party confernce bacame. 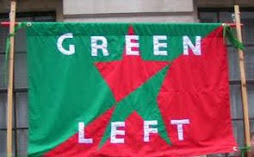 Green Left, the only ecosocialist group in the Green Party, which was founded in 2006 and also recognised outside the party as a leading voice on the left has yet again been refused space to have a fringe at our GPEW Conference for the 2nd year running. At a time of major realignment of the left in the wake over the recent past not least the victory of Jeremy Corbyn a partial vote has been taken to exclude the very group that has been promoting left policies for the party and working with others on the left for the last 10 years with such success for the party in terms of members and votes. With nearly 8000 members on our respected Facebook site that enables activists to find out about campaigns and green politics and is a good place to exchange views and ideas we know the thirst for ecosocialist ideas and how positive it is for those who know little about the Green Party to know that we have left policies they can support.Its clear Green Left has something to say - and we the GPEW should never act like new Labour in preventing discussion andideas in our party being heard.